Dr. Idalia Santaella, M.D. is the Medical Director of Fine Needle Aspiration Clinic in Coral Gables. Idalia Santaella, M.D. 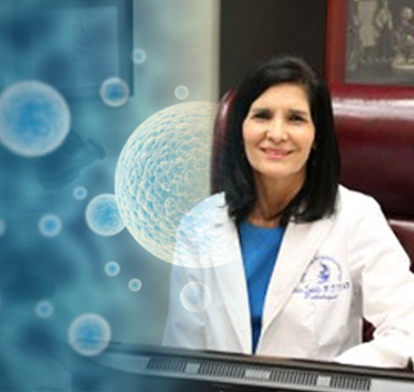 is a Board Certified Pathologist and Cytopathologist with over 25 years of experience performing and/or interpreting Fine Needle Aspirations (“FNA”). She is also certified in Ultrasound-Guided Fine Needle Aspirations by the College of American Pathology and has performed and/or interpreted around 1,600 to 2,000 FNA cases each year and has accumulated over 50,000 FNAs throughout her career. Dr. Santaella did her pathology and cytopatholgy training at the Medical College of Virginia under the guidance and supervision of Dr. William Frable. Dr. Frable was the Director of the Pathology Department at the Medical College of Virginia and one of the pioneers of FNAs in the United States. Dr. Santaella also received cytopathology training at the Karolinska Institute in Sweden, which was the main institute that pioneered fine needle aspiration techniques and interpretations through out the world.